Go green or go big? Automakers are flooding the market today with hybrids, plug-in hybrids and electric battery-powered cars, with more models on the horizon. Even as production of green cars ramp up, automakers are unveiling a dizzying number of vehicles with larger and ever more powerful engines. A Jeep Grand Cherokee with 707 horsepower. A Lamborghini SUV that can whip laps like its supercar siblings. A Rolls-Royce truck built with a twin-turbo 6.7-liter V-12 engine that averages 14 miles per gallon on city roads and highways. The Lamborghini Urus is seen here. SUVs account for 70 percent of the U.S. market versus 1.5 percent for electric vehicles. Automakers are happy to give customers what they want: sport-utility vehicles have higher margins and generate more revenue. With more gas guzzlers on the road, can automakers still tout their carbon-cutting credentials? The average new vehicle transaction price in October was $37,007, according to Kelley Blue Book, which tracks monthly sales. Sales of SUVs and CUVs, which have a higher sticker price than traditional sedans, are helping to push that number to new records. 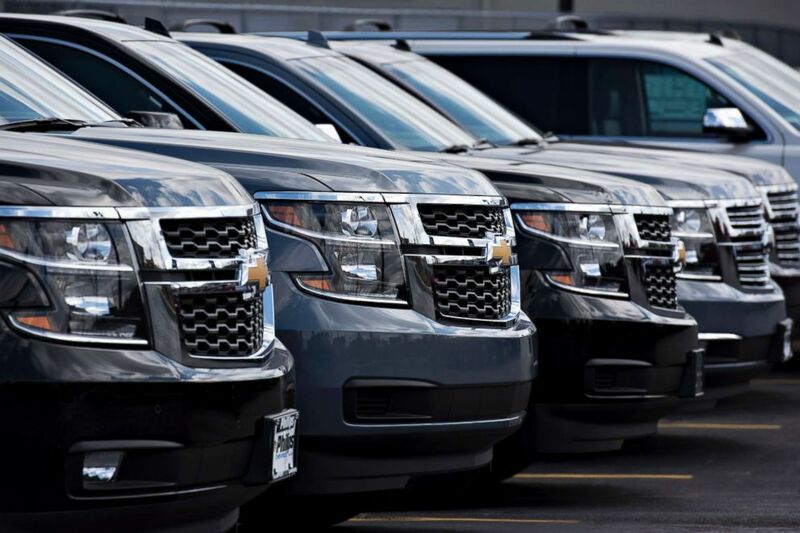 Chevrolet Suburban sports utility vehicles are displayed for sale at a dealership in Frankfort, Ill., April 30, 2015. “The bulk of America speaks with its wallet,” said Acevedo. Last month an electric vehicle sold for an average of $63,366, according to Kelley Blue Book data. Compare that to the price of a full-size SUV/crossover ($62,833), mid-size car ($25,548) and luxury car ($56,234). 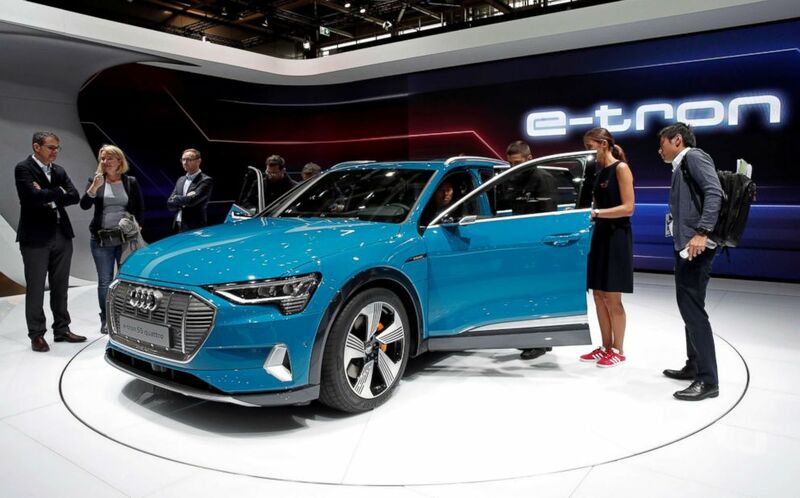 “In order to become a mainstream, practical option, the overall cost and range of an electric car must be on par with a traditional ICE [internal combustion engine] vehicle,” Brandon Mason, an automotive analyst at PwC, told ABC News. He estimates that will happen by at least 2027. Ford Motors said it will offer 16 electric vehicles (EVs) and 24 plug-in hybrids and regular hybrids by 2022 — an investment of $11 billion. The Detroit automaker currently sells five electrified vehicles, including an electric battery-powered Focus. Even its iconic Mustang sports car will go green; a V8-engine hybrid version debuts in 2021. General Motors said it was increasing production of its Bolt electric car by 20 percent to meet global demand. 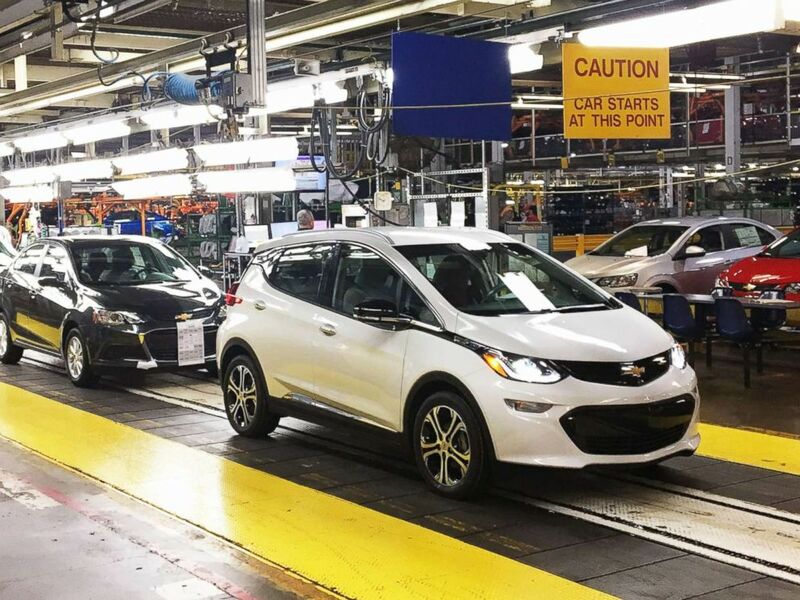 Sales of the Bolt are up more than 15 percent this year, though the majority of sales are outside the U.S.
Workers assemble Chevy Bolt EV cars at the General Motors assembly plant in Orion Township, Mich., Nov. 4, 2016. German automaker Porsche, which started the luxury SUV craze, boasts seven “E-hybrid” vehicles, including six plug-in Panameras and one plug-in Cayenne SUV, which got a full redesign for 2019. Porsche still leads the competition in terms of performance vehicles with environmentally friendly cred. 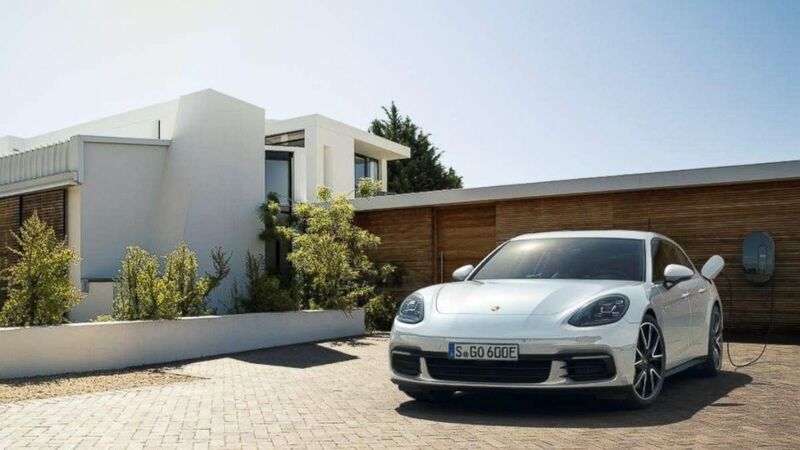 In Europe, for example, 63 percent of Panamera sales have the hybrid powertrain, which allows the vehicle to go short distances on the electric battery. A fully electric Porsche “Taycan” will begin production next year. The Porsche Panamera 4 E-Hybrid Sport Turismo has four powertrains: three gasoline and one plug-in hybrid that adds an electric motor to enhance performance. Volkswagen, Europe’s largest automaker by sales, said on Wednesday it would convert three factories in Germany to build electric cars. The rise of the electric car can be credited to two factors: Tesla and government regulations. “Even though it’s a smaller player, Tesla casts a large shadow on the industry,” Acevedo explained. 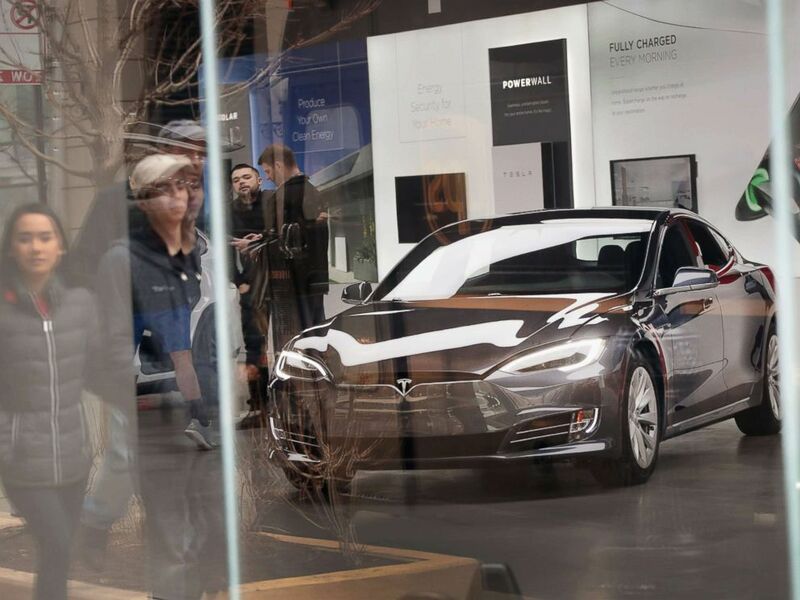 The Model S, Tesla’s $70,000 sedan, was not an instant sales success, he noted. But it “hit its stride” over the years and regularly outsells its gasoline-engine luxury sedan competitors. “A lot of Tesla’s market promise came from the Model S,” he said. A Model S sits on the showroom floor at a Tesla dealership on March 30, 2018, in Chicago, Ill.
Ferrari has been quietly testing its gasoline-electric hybrid car. Aston Martin joined the electric car club with its Rapide E sedan. 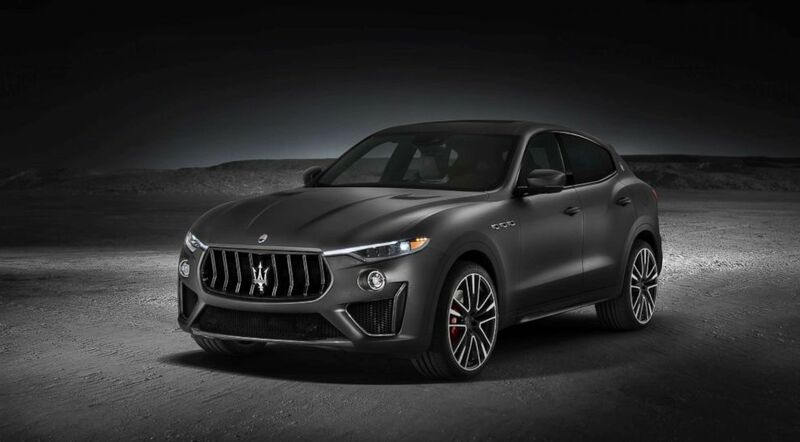 Not to be outdone, Italian sports car maker Maserati recently announced hybrids are in its future even as it rolls out two high-performance versions of its Levante SUV: the GTS with 550 hp and the 590-hp Trofeo. “The V8 is predominantly focused on the U.S. market,” Matt McAlear, head of product marketing for Maserati North America, told ABC News. The two V8 models will make up 10 percent of this year’s sales, he said. But by 2022 the Levante can brag that its driving dynamics and performance come without the help of a conventional engine. The Maserati Levante Trofeo is pictured in an undated promotional image. China, the world’s largest car market, also ranks as the No. 1 market for electrified vehicles. Chinese officials have declared their intentions of putting more electrified vehicles on the road, and sales, unsurprisingly, are up. “There’s a huge national investment and generous rebates for the production of electric cars,” Acevedo said. Lawmakers in France, India, Norway and Britain are also toying with banning sales of new gasoline and diesel cars. The dichotomy between government and consumer demands are forcing automakers to hedge their bets, Mason pointed out. “They need to have a global portfolio,” he said. Particularly confusing for automakers are efforts by the Trump administration to weaken the fuel economy standards established by former President Obama. In August, the Environmental Protection Agency and National Highway Traffic Safety Administration proposed freezing CAFE (Corporate Average Fuel Economy) standards at 37 miles per gallon for new cars and trucks manufactured for sale in the U.S. for model years 2021 through 2026. The Obama administration in 2012 put in place rules that raised CAFE standards for new cars and trucks to 54.5 mpg by 2025. Seventeen states and the District of Columbia have filed lawsuits against the rollback by President Trump. Regardless of the upcoming legal battles, electric cars and hybrids are not going anywhere. Automakers have also learned that design is just as important as range. People inspect the Audi E-Tron 5S Quattro during the first press day at the Paris auto show in Paris, Oct. 2, 2018. But don’t write off the gas-guzzling SUV just yet.